According to recent statistics from the American Heart Association, about half of adults in the US engage in moderate or vigorous physical activity on 3 or more days per week (Go AS, et al. 2013). If you're a glass is half-full person, you might interpret that as "pretty good." However, if you dig a little deeper, the picture gets worse. That statistic only describes aerobic forms of exercise. All adults - including seniors - should perform both aerobic and strength exercise. The CDC conducts an ongoing survey of Americans as part of the Behavioral Risk Factor Surveillance System (BRFSS). Data from this survey reveal that only 20% of adults in the US meet the recommended guidelines for both aerobic exercise and strength exercise (Harris CD, et al. 2013). Regarding the elderly, data from the 2015 annual "Health, United States" report show that 60% of men and 71% of women ages 75 years and older in the US failed to meet either the aerobic or strength exercise guidelines. The most obvious reason why older adults should exercise regularly is because doing so can reduce the occurrence of health problems. Today in the US, chronic - and mostly preventable! - health problems are the largest category of health care costs. One resource estimates that a whopping 75% of $2.8 trillion spent on health care goes towards treating preventable chronic illnesses! To put these numbers in perspective, according to the 2010 census, there were 221 million adults (ages 21 and above) in the US. And here is a really shocking finding: An analysis of the 24 countries that are part of the Organization for Economic Co-operation and Development (OECD) revealed that there is absolutely no correlation between the amount of money a country spends on health care and the longevity of its citizens! (Fuchs VR. 2014). Pretty much every one of the health problems listed in the table above can be prevented with regular exercise and by following a smart diet. Maybe we should be focusing more efforts on that strategy! • Aerobic Exercise: Members of the "50 Plus" running club were studied over a period of 13 years. The typical member had run nearly 26,000-km over the previous 11 years before being enrolled in the study. Men ran an average of 2316-km per year and women ran an average of 1691-km per year. These runners had significantly lower levels of disability than non-runners of a similar age range (Wang BWE, et al. 2002). • Strength and Balance Exercise: Elderly (75 yrs and up) subjects participated in a daily, home-based exercise program designed to improve arm strength, leg strength, and balance. Assessments were made at 3, 7, and 12 months. Those who participated in the exercise program had less disability than those who did not (Gill TM, et al. 2002). More than 30% of older adults fall every year. One in 20 hospitalizations of older people is directly related to falling. The consequences of a fall often lead to substantial financial costs and a significant change in quality-of-life. The annual medical expense for fall-related injuries in US adults over age 65 is greater than $20 billion (2005 data). In addition to pain and decreased mobility from a fall, other consequences can be much more serious. A fall can cause hip fracture, bleeding into the brain, and premature death. Physical conditioning with a structured exercise program that includes balance training is considered the most important component in reducing falls. Regular Exercise Can Improve Mental Health, Too! When we think of the health benefits of exercise, we mostly think of the physical benefits. But, regular exercise provides a variety of mental health benefits, too. People who exercise regularly have less depression and they sleep better. In addition, there is growing evidence that regular exercise can prevent the development of dementia. I've been saying for years that what's good for the heart is good for the brain: research is now showing that aerobic exercise and a heart-healthy diet can also reduce your risk of developing dementia. I have written an extensive review of how exercise can prevent dementia here: "Exercise and Dementia". Being Fit Can Prolong Your Life! In addition to the benefits I've already summarized, it turns out that maintaining your fitness can literally prolong your life as you get older! Anne Newman, MD, MPH, and colleagues at the University of Pittsburgh assessed the performance of 2324 subjects ages 70-79 yrs old on a 400-meter walk. They found that those who had the poorest performance (walk time > 362 seconds) had a higher risk of death compared to those with the best performance (walk time < 290 seconds). Each additional minute predicted a 29% higher rate of mortality (Newman AB, et al. 2006). The American College of Sports Medicine (ACSM) is one of the preeminent scientific groups that develops exercise guidelines. 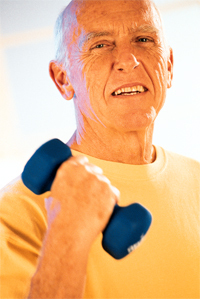 In August 2007, they began including specific exercise guidelines for older adults (Nelson ME, et al. 2007). OK, so exercise is important for older adults, too. But, isn't it risky? It is natural to be concerned any time an elderly person subjects themselves to strenuous exercise. Falls are a serious concern in older subjects. Falls often lead to broken hips. And a broken hip can be an injury that a person never completely recovers from. And the presence of osteoporosis makes fractures more likely. • Respect your skeleton: Because of osteoporosis, and, the simple fact that a 70-yr old body doesn't heal as readily as a 15-yr old body, avoid activities that increase the chances of a fall or a collision with another person. For example, riding a bike is a low-impact exercise. However, if you have bad balance or bad eyesight, maybe riding a bike isn't the smartest activity for you. And basketball is a great exercise for bone density. The jumping and change-in-direction running stimulate bone density. But, there is a high likelihood of both collisions and falling while playing basketball. • Respect your back: Again, due to the possibility of osteoporosis, be very careful of any exercise that involves lifting with the back. In some elderly people, simply bending over at the waist can lead to spontaneous fractures in the spine. So, while yoga improves flexibility, it might be a bad choice for some older adults. • Respect your heart: Atherosclerosis is a disease that progresses as we age. Many people have some degree of atherosclerosis even if they have never had a heart attack or stroke. So, an abrupt increase in physical activity might precipitate cardiovascular symptoms. This is why it's wise to obtain clearance from your personal physician before starting a new exercise program. And, using a heart rate monitor is a smart idea, too. We feature some good ones here: Heart Rate Monitors. BUT OLDER ADULTS CAN BE ATHLETES TOO! • In September 2013, American swimmer Diana Nyad swam from Cuba to Key West. That's 103 miles! She was 64 when she did it! • Several years ago, at a track meet in Clermont, FL, I personally witnessed a 62-yr old guy set a world record in the pole vault for his age group: he cleared 12-ft, 1-in. Today, the record for this age group is a foot higher! • Walter Bortz, MD, a professor at Stanford University, and his wife are the first married couple over the age of 70 to have competed in and finished the Boston Marathon. 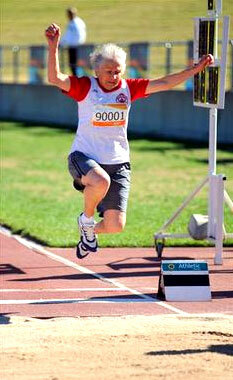 • Olga Kotelko decided to compete in track and field when she was 70 years old! From then until the day she died - at age 94! - she did. Along the way, she set hundreds of Masters-level track-and-field world records. To the right is an image of her competing in the long jump. But she competed in events that you might think would be risky for a woman of her age, too: the high jump, the shot put, the javelin throw, and even the hammer throw! When she was 93, researchers at the University of Illinois in Champaign studied Olga Kotelko's brain. It was found that it was larger than others her age. This provides further evidence that regular exercise is good for brain health, too. I've discussed this in the review "Exercise and Dementia." 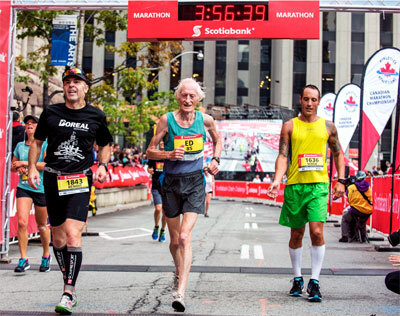 At age 73, he ran that same marathon in 2 hours 54 minutes 48 seconds. He is the only person older than 70 to have run a marathon in under 3 hours. If you're a die-hard competitor and want to compete against other seniors, then check out the Huntsman World Senior Games, in St. George, Utah (www.SeniorGames.net). WHAT TYPES OF EXERCISE ARE BEST FOR OLDER ADULTS? • Bicycling: Bicycling is a perfect exercise for improving aerobic capacity. In addition, it will help to strengthen the legs, especially the quads, without placing too much strain on the knees and other joints. Bikes with electric motors can be used for assistance pedaling uphill or if you get too tired to make it back home. 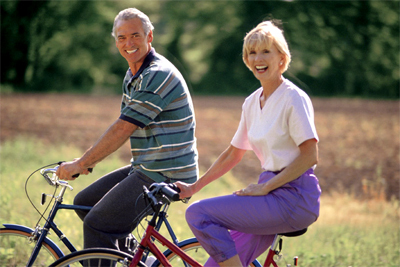 Bicycling is not helpful for maintaining bone density, however. • Hiking: Hiking can be a lot more aerobic than you might think, especially if the trail is hilly or if you're wearing a backpack. In addition, it has been determined that getting out in nature has psychological benefits, too (Berman MG, et al. 2008). • Jogging: Obviously, millions of older adults jog regularly. Note that the designation of exercise as either "moderately intense" or "vigorous" is determined by how fast your heart is beating, not how fast your body is moving across the ground. For many older people, a slow jog qualifies as intense exercise. Heavy breathing indicates the activity requires too much effort. One way to evaluate if you're working too hard is to see if you can easily talk in full sentences while you're exercising. Consider investing in a heart rate monitor to make sure you don't push yourself too hard. • Pickle Ball: Despite the silly name, pickle ball is very popular with older adults. It's sort of like playing ping-pong on a tennis court. You use paddles like in ping-pong and the court you play on is similar to a tennis court. • Swimming: Swimming offers a combination of resistance exercise with aerobic exercise. Swimming is an excellent exercise for older adults because it avoids placing excessive strain on lower joints. Swimming also strengthens the core muscles (eg., the back and abdomen). 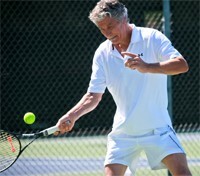 • Tennis: Tennis has been a popular form of exercise with seniors for decades. But singles tennis can require 7 times more energy than sitting. So, that's why many older adults play doubles. • Walking: Plain old walking is vastly underrated. Walking improves leg strength, cardiovascular capacity, reduces the risk of heart attack, stroke, hypertension, type-2 diabetes, and improves balance. "Brisk" walking is the best example of moderate-intensity aerobic exercise. Brisk walking is described as "walking with a purpose." Textbooks list brisk walking at 3-4 miles per hour. However, most older adults will walk at 2-3 mph. Resistance exercise can be done with weights, stretch bands, or by lifting your body weight against gravity. I like stretch bands for older adults: it's a lot easier to do overhead exercises, and, stretch bands don't hurt if you drop them on your toe! We feature several brands here: Resistance Bands. Note that different colors represent different levels of resistance. You can also use plastic milk jugs and fill them with water or sand. One gallon of water weighs 8.3 pounds. You can loop a wide belt through the handles of 2 of them and make some hefty dumbbells or ankle weights. Resistance training to reduce falls should be designed to increase core strength and leg strength. "Core strength" refers to toning and strengthening of the abdominal and back muscles. In general, a good resistance exercise program should gradually progress from light to heavier resistance and from simple to more complex techniques. In addition, it should include exercises to improve balance. Warm up with 5 minutes of light aerobic activity, such as walking on a treadmill or riding a stationary bike with little resistance. The goal is to slightly increase your heart rate and warm up your muscles and joints. Once you are warmed up, spend the next few minutes on core strength. A good rule of thumb is to always exercise your largest muscle groups before smaller muscle groups. Another way of describing this is to start at the center of your body and work outwards. So, exercise your abdomen and your back before you exercise your arms and legs. • Abdomen: Lie on the floor on your back. Bend your knees and bring your feet closer to your body. Place your feet flat on the ground. Keep your knees together. Fold your arms across your chest. Now, attempt to curl up by contracting your stomach muscles. You don't have to perform a complete sit-up, but, if you can, that's great. Additional abdominal exercises can be added as you get more comfortable. For example, if you point your knees outward, away from each other, while keeping your feet together, you will take your hip flexors out of the movement, thus forcing your abdominal muscles to work harder. Doing some simple toe-touches is an excellent way to improve the strength and flexibility of your back. If you can do them from a standing position, that's great. However, it's easier and safer if you do them while seated in a sturdy chair. Simply lean forward, bending at the waist, dangling your arms down, and then sit back up. If you feel any strain in your back during these exercises, decrease your range of motion or just stop. • Leg Exercises: Next, do some progressive resistance exercises for the legs. These can be performed by using the resistance machines at the gym. The main muscle groups that you will work are the muscles that move the legs in and out, the front and back thigh muscles, and the calf muscles. If you exercise at a gym, ask a trainer to guide you through the exercises on the machines. Start with light resistance, making sure that you can complete at least one set of eight to 12 repetitions before adding more weight on your next workout. Limit these resistance training sessions to no more than three times per week. But, using a sturdy chair at home is easier. Simply standing up from a seated position over and over will be good exercise for your leg muscles. This is the equivalent of using a leg-press machine. You can also do leg-extension exercises using a chair and some ankle weights: While seated and while wearing ankle weights, simply straighten one leg so that your foot is pointed forward. Do 8-12 repetitions with one leg, then do 8-12 repetitions with the other leg. • Hip Flexors: One muscle group that doesn't get enough attention is called "hip flexors." These are the muscles that run along the front of your hip joint. When they contract, they lift your foot off the ground. For simplicity, I like to call the exercises that train these muscles "standing knee lifts." Lifting your feet high off the ground when you walk would be a good way to exercise these muscles, but, you might look pretty silly doing this as you walk around your neighborhood. Nevertheless, that's the motion that trains these muscles. Again, some ankle weights will be very helpful here. Put on your ankle weights and simply march in place, lifting your knees high. Training your hip flexor muscles will help you avoid stumbling and falling when you walk. With age, a combination of factors decreases balance. Balance is controlled largely by the inner ear. Atherosclerosis - the process that leads to heart attacks and strokes - can affect the inner ear, as can several kinds of drugs. But balance is also affected by weak muscles in your feet, ankles, and lower legs. If you stand on a BOSU ball - be careful here! hold onto something - you will quickly feel those muscles firing like crazy as they make the tiny adjustments to maintain your balance. Training these muscles will definitely improve your balance. The type, duration, and intensity of balance exercises is based on what a person is most comfortable starting with and will continue performing on a regular basis. Unlike resistance training, you can and should do balance exercises daily. See how long you can stand on one leg. You will need a stable structure to hold on to. Use the back of a sturdy chair, or stand in a doorway or next to the kitchen counter. Lift one foot off the ground. Practice a few times while holding on. Once you are comfortable, slowly release your hands while continuing to stand on only one foot. Repeat with the other leg. Measure the number of seconds you are able to keep each leg lifted without needing to grab the doorway or put your leg down. Balancing on one foot is an excellent exercise, and by measuring how long you can hold each leg up, you can keep track of your progress. Do the exercise with repetitions. Balance on one foot for 10 seconds, then put your foot down for 10 seconds, and then raise it again. Do four to eight repetitions on each foot. Keep your head and eyes level; don't look down or bend over. Do this in a doorway or next to something stable that you can grab quickly if needed. After you have mastered this, try it with your eyes closed. Once you are very comfortable with balancing on one foot, you can advance to the next stage. Balance on one foot, and lift your other leg out in front of you without bending it at the knee (at this point, you look as if you just kicked a field goal). You can then practice holding it backward (behind you) and then to your side. Keep the leg you lift straight. Always stay in control by holding on with your hands as you need to. • Tai Chi: Tai Chi is a series of slow, purposeful body movements coordinated with mindful breathing and mental focus. Many Americans have never heard of Tai Chi, let alone tried it. But, it is worth considering. It can improve balance and also increase muscle tone and strength. It can also lower stress. Researchers at Tufts Medical Center in Boston published a study in the July 19, 2016 issue of the Annals of Internal Medicine showing that performing Tai Chi for 60 minutes twice per week was just as effective as standard physical therapy in reducing knee pain in patients with osteoarthritis (Wang C, et al. 2016). I have written a detailed summary of balance exercise here: "Balance: An Overlooked Element of Fitness?". • Pilates: Pilates is a low-impact exercise which makes it suitable for older adults. Pilates improves the strength of the core muscles, which are important in balance and everyday movements. In addition, Pilates improves flexibility. • Water Aerobics: Despite "aerobics" being part of the name, water aerobics is part aerobic exercise and part strength exercise. Doing aerobics in a pool avoids the risk of a fall. And moving your arms and legs against water provides a form of resistance exercise. • Yoga: Yoga has the potential to improve balance, strength, and flexibility. However, some of the poses might place too much strain on your back. If you have back problems, or have osteoporosis, be cautious when doing yoga poses. 1) Aim to exercise three days per week initially. Gradually work up to five days per week, varying the program on alternating days to prevent boredom. 2) The higher the level of obesity, the more difficult it will be to exercise. Start with 30 minutes of exercise broken down into 10 minutes of cardiovascular activity (eg., walking on a treadmill, stationary cycling), 10 minutes of weight-lifting using 5-10-pound dumbbells, and 10 minutes of flexibility exercises. Increase the duration of each phase of exercise as you become more capable and comfortable with the program. Rest as necessary. 3) Intense effort is not the goal. If you cannot carry on a conversation while walking on the treadmill or riding the exercise bike, you are exercising too hard. If you develop chest pain, shortness of breath, or feel lightheaded, stop exercising immediately. 4) If your leg muscles are weak, try non-weight-bearing activities, such as water exercises (ie., exercises in the pool), and arm and leg cycling. 5) Do not be too concerned about your weight during the early stages of the program. The primary goal is regular exercise. Hiring a properly trained and certified personal trainer, at least during the first few exercise sessions, is highly recommended. Exercises that improve physical strength and aerobic capacity can reduce the risk of developing chronic health problems as you age. And performing balance exercises can decrease the risk of falls. However, if you are older than 50, or if you have heart or back problems, consult with your personal physician before beginning a new exercise program. Then, once you have the OK, gradually incorporate the 4 types of exercise into a weekly routine: aerobic, strength, flexibility, and balance. The National Institute on Aging, a division of the National Institutes of Health, offers a variety of publications here: www.nia.nih.gov. International Council on Active Aging (ICAA) www.icaa.cc: ICAA focuses on wellness during aging. They are based in Vancouver. 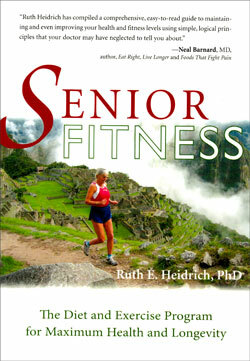 A book on this topic that you may like is "Senior Fitness" by Ruth Heidrich, PhD. Don't be misled by the fact that it was published in 2005...this book is a good resource on the benefits of exercise and a vegetarian diet for specific medical conditions.